The smallest of the three cities in the Tampa Bay Area, Clearwater is located on the western coast of Florida and is well known for its stunning beaches, warm waters, and beautiful parks. Home of the non-profit Clearwater Marine Aquarium and the stunning Moccasin Lake Nature Park, environmental conservation is a big part of Clearwater culture, making the city a popular destination with nature and wildlife lovers. Clearwater has several super kayaking spots for you to try out. Kayakers regularly flock to the area due to its varied array of kayaking trails and unbeatable scenery. If you want to enjoy some unforgettable kayaking adventures in Clearwater, be sure to check out one or more of the locations listed below. One of the last few untouched barrier islands along the Floridian coastline, Caladesi Island State Park offers beautiful surroundings and highly enjoyable kayaking. Several miles of kayak trails can be found around the island, all cleverly and conveniently signposted with white poles. The island is a wildlife hotspot, home to all kinds of birds, as well as many species of fish and other marine life, so if you'd like to have a chance of spotting some animals while kayaking around Clearwater, this is a great location to choose. Another very popular kayaking hotspot in the Clearwater area is Fort De Soto Park. Boasting a beach that was actually ranked as the best family beach in all of America not so long ago, this park is made up of five keys and covers a space of around 900 acres. A 2.25 mile, beginner-friendly, self-guided kayak trail can be followed at this location, as well as kayaking tours and more. Weedon Island Preserve covers a little less than 4,000 acres of protected land in the Old Tampa Bay area. Home to all kinds of animals from manatees and dolphins to birds and more, this is a pristine natural environment with so much to offer for kayakers of all ages. The South Trail is one of the best kayaking trails to check out at this location, with lots of thrilling mangrove tunnels to explore and saltwater ponds to paddle along. With kayaking being such a fun activity in Clearwater, the city is home to several great kayaking tour and rental companies. Offering outfitting services and all the kayaking trips you could hope to find at one of the Sunshine State’s prettiest coastal towns, these Clearwater kayaking companies help to make your outdoor adventures better than ever. With small groups and friendly guides leading the way, Coconut Kayak Tours provides truly authentic and simply magical kayak tours of the Clearwater area. For manatee and dolphin encounters, this is a great company to choose as you and your small group of friends or family will head out through the mangroves and welcoming waters around Caladesi Island, Clearwater Beach, Shell Key, Weedon Island, and other great locations all around Clearwater. Coastal Xcursions offers a huge range of water-based tours and activities in Clearwater. This company's kayak eco tours are some of the best in the area, with a wide range of options aimed at both beginners and experts. Kayak tours with Coastal Xcursions explore the mangrove tunnels around Caladesi Island and can be enjoyed at any time of day, including sunset. Located mere minutes outside Clearwater in the next-door town of St Petersburg, Streetwater Kayaks is one of the best kayaking outfitters and tour agencies in the entire Tampa Bay Area. 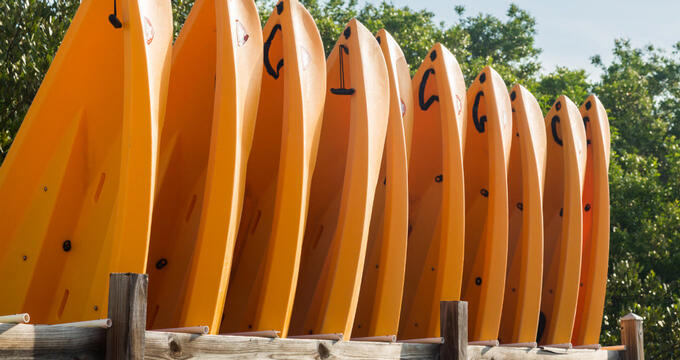 Whether you're looking for guided kayaking tours of the Clearwater and Tampa Bay Area, kayak lessons, kayak rentals, or even kayak repairs and purchases, this company will be able to meet your needs.